Can anyone exhibit? Yes, you do not have to be a member to exhibit. Bookings are subject to curatorial approval and the timetable. What kind of works can I exhibit? 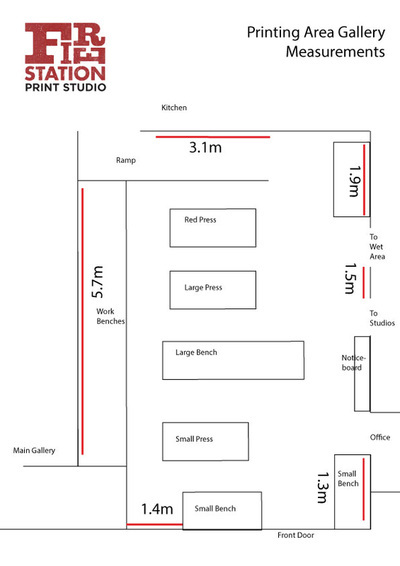 As the gallery is adjacent to a print workshop, preference is given to prints, works on paper and artist's books. However paintings, photography, sculptures and installations have been successfully exhibited. 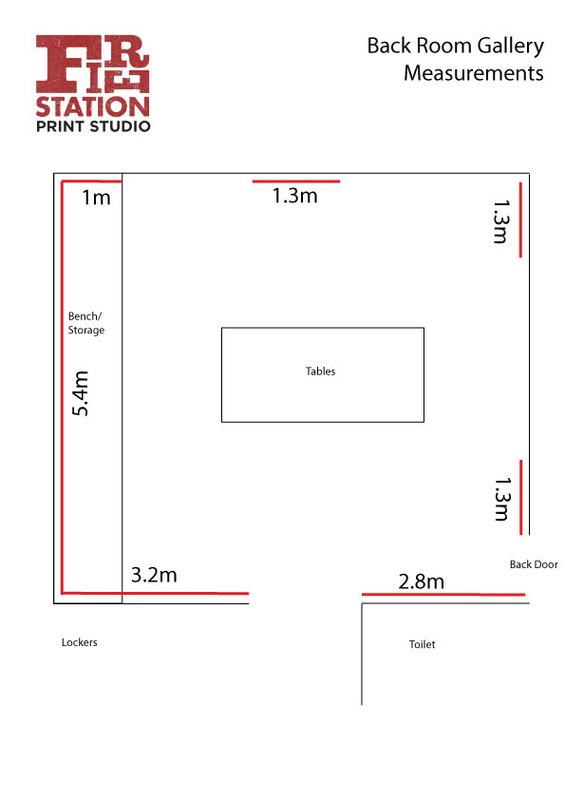 See the floor plan below for an indication of hanging space. The Firestation reserves the right to determine the suitability of all work for exhibition, so your proposal must include examples of your work. Is there a hanging system? 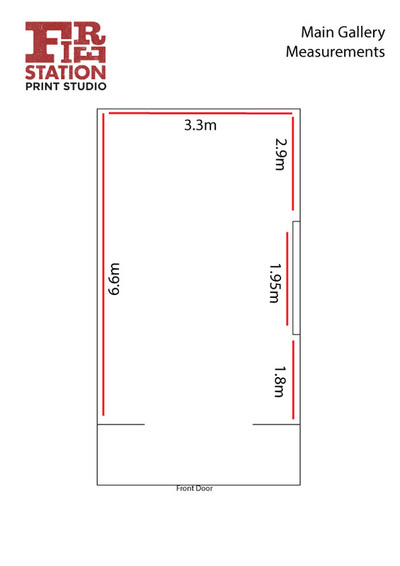 Yes, for both framed and unframed works on paper. We have installed a multiple metal strip/magnet system that allows easy hanging of unframed works with magnets. There are also display cases for Artist books etc available. How many works can I exhibit? Check the floor plan below for dimensions. Allow reasonable space between works. If you have additional works, the Print Workshop and the Community Arts room may also be available to hang in, at no extra charge. What does it cost? Main Gallery hire is $450 per week, ($360 per week for members) with a minimum hire period of 3 weeks. The workshop wall space and or the Back Room Gallery are also available for separate hire. Contact us for details There is a twenty per cent commission on sales. See the contract for further details. We can also provide graphic design of a postcard invitation and emailable file for FB and web use (extra $50). You are required to sit the show on Saturdays (and Sundays if you want to open the gallery on a Sunday). A deposit of one week's hire is required to secure your booking with the balance due one month before the exhibition date. This deposit is non-refundable. You are also responsible for catering for the exhibition opening if you choose to have one. What if I need help with my show? You can ask one of our approved curators to help you. They charge a fee that you negotiate with them. You can also hire the services of a PR writer if you choose. How do I book? Check the timetable for available space, and if you are interested email us.